The hotel is located directly adjacent to the iconic Olympic Stadium, in the heart of the Westfield Stratford City complex. 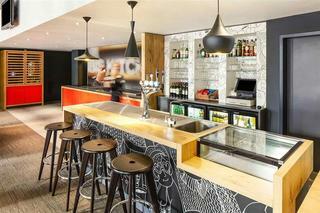 The hotel is situated close to an impressive selection of 42 different restaurants and a plethora of designer brands. The U.K's largest casino is also less than a minute's stroll away and there are a host of other amenities on the doorstep, from cinema, to ice rinks and bowling. 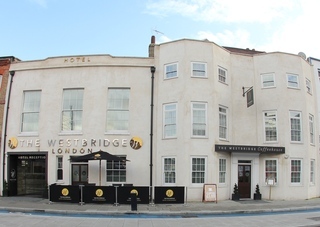 The hotel also offers some of the best transport links in London, with a journey time to Liverpool Street Station of just 7 minutes and to Waterloo of just 15 minutes.This 162-room, air-conditioned aparthotel was built in 2012 and features a lobby with 24-hour reception, lift access and a cloakroom, as well as a hotel safe and a newspaper stand. The hotel offers a breakfast room, free wireless Internet access throughout the entire hotel, room service and a car park. Guests can purchase essentials, from food and drink to toiletries, at The Pantry and there is a guest laundry room. 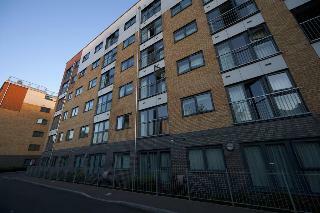 A car park is available for an additional fee payable locally.The contemporary Studio and One-Bedroom Suites provide plenty of space to live and work and every suite has a fully equipped kitchen, free wireless Internet access and an exercise room overlooking the Olympic Park. All of the en suite rooms are furnished with a king-size bed and equipped with a shower, a bath and a hairdryer. Each of the rooms features a direct dial telephone, satellite/cable TV, a radio, a hifi and a safe. Guests will find a fridge, a cooker, a microwave and tea and coffee making facilities, as well as a washing machine and ironing set in each of the suites and all of the rooms have individually regulated air conditioning and heating. Some of the rooms are equipped with a terrace.Three nights a week this aparthotel offers a social evening with free drinks and snacks for all guests. A gym is available for the use of guests.The Hub Kitchen serves a complimentary hot breakfast buffet daily. 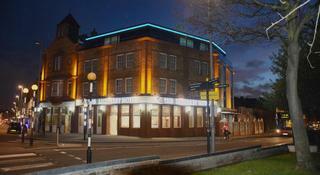 This comfortable hotel can be found in Stratford. The premises count with 188 welcoming accommodation units. Travellers will not be bothered during their stay, as this is not a pet-friendly hotel. 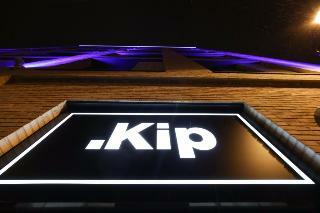 Located a minute's walk from Hackney Central station, Kip offers accommodation with free WiFi. Guests are 350 yards from Hackney Empire theatre, and can reach Westfield Stratford City via public transport within 15 minutes.Each of the air conditioned bedrooms offers either an en-suite or shared shower. Bedrooms have a flat-screen TV and storage space. A selection of the larger rooms offer a seating area and the studios feature a fully equipped kitchen.The hotel includes a 24-hour front desk. Guests are within a 10-minute walk of a number of shops and restaurants.Kip is 1.2 miles from Victoria Park, and 2.5 miles from Emirates Stadium. London's Olympic Stadium is 20-minutes away by public transport, and guests can reach Oxford Street within 30-minutes on the London Underground.We speak your language! ibis London Stratford positions you perfectly for your London getaway and, from check-in to check-out, we've got your every need covered. Our bar will keep you refreshed from morning to midnight, and our on-site restaurant offers a relaxing spot to enjoy a lazy lunch or an indulgent evening meal. So whether you're here to take in a show at the O2, shop 'til you drop at Westfield or take care of business at Canary Wharf, we've got you covered for a great stay. 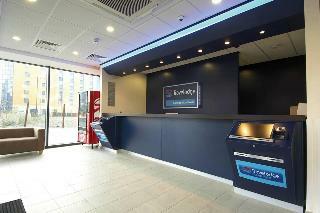 These apartments are located close to the Olympic Stadium, offering easy access to Central London and Canary Wharf. The O2 and Excel venues are only minutes away and with the Central Line, Jubilee line, Docklands Light Railway and National Railway networks out of Stratford, this is an ideal location for business and leisure. London Heathrow Airport is 36 km from the hotel, while London Gatwick is 81 km away. The hotel is 46 km from London Stansted Airport and 78 km from London Luton Airport.This new development was built in 2008 and consists of 111 luxury apartments. It was constructed to meet the increasing demand for top-quality accommodation close to the Olympic Stadium, without the City price tag, while still offering easy access to Central London and Canary Wharf. They have a 24-hour reception and check-out service and all have lift access. There is a car park in which guests can leave their vehicles.Twin beds and sofa-beds are standard in all apartments to achieve maximum flexibility and occupancy. The one-bedroom apartments can sleep up to four people, making them the most cost-effective and affordable luxury apartments in London. Facilities include Internet access, a direct dial telephone, washing machine, ironing set, satellite TV, radio and central heating. Each apartment has a private bathroom with shower, bathtub and hairdryer and a kitchen with fridge, cooker, microwave and tea and coffee making facilities. A private balcony or terrace is also standard in all accommodation units.For a 2 nights' stay or more, a welcome food and drinks hamper is provided.